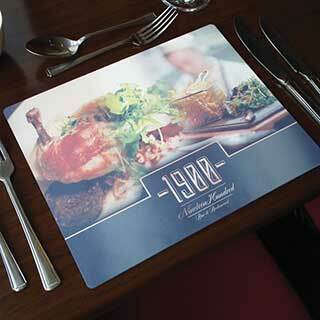 We have a good range of table mats to suit all catering establishments. Whether your restaurant requires full colour personalised placemats, traditional leather table mats or real wood coasters we have table mats catering for all. 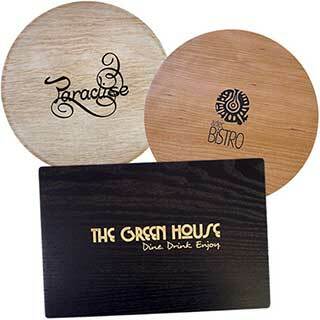 If you need your table mats and coasters in a hurry choose from our standard designs in plain melamine or wood effect. 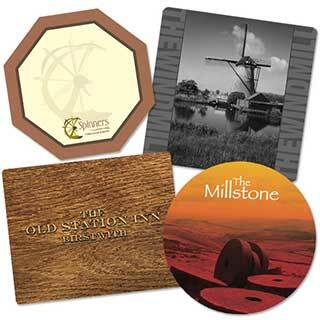 Table mats and coasters are supplied in all sizes and in a range of colours to suit any décor. They can be personalised in gold or silver blocking and there is a range of free borders available - single line, double line or greek key design. Three classic colours to choose from - Black, Burgundy or Brown. Personalised with your logo - One off set up from £35 - Blocking in gold or silver. Personalised with or without a gold or silver border. No border available on 15” x 12” leather tablemat. Matching coaster available in square, round or octagonal shapes. 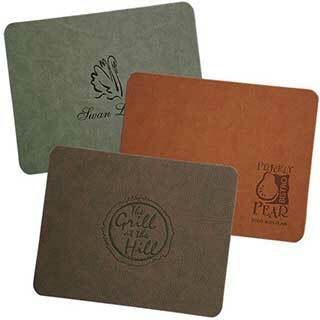 These wooden hotel and restaurant placemats and coasters are strong and durable with a higher quality veneer, featuring a hand crafted finish that is unsurpassed. Five different sizes available. Available in 12 wood finishes - Light Oak, Dark Oak, Cherry, Distressed Oak, Light Ash, Black Ash, Walnut, Whitewashed, Mahogany, White, Warm Grey and Light Blue. No backing, easy wipe clean. Personalised Engraving:- Can be engraved with your own design up to 90 cm2. One off set up from £35. Plus Per item charge of £3.40 for table mats and £2.25 for coasters. Minimum order 10 table mats. Matching coasters available. These new faux leather hotel and restaurant table mats and coasters are made from a hardwearing textured material with a hard board interior and black felt backing. These faux leather table mats are heat and slip resistant and can be heat embossed or foil blocked in either gold or silver with your logo and/or three different free borders. Black felt backing. Hard wearing finish. Choice of six colours - Black, Blue, Dark Brown, Green, Grey and Tan. Two table mat sizes + coasters. No charge for standard borders. Personalised with your logo - One off set up from £35 - Heat embossed or foil blocked in either gold or silver. 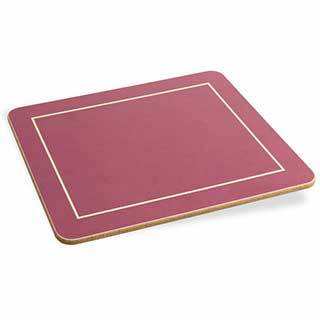 These plain melamine hotel and restaurant table mats and coasters are made from genuine melamine which gives excellent heat and stain resistance and should give years of trouble free use. Melamine tableware available in rectangular table mats and matching coasters. Slip resistant cork backing. Placemats 6mm thickness. 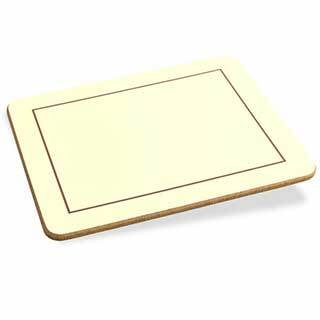 Coasters 4mm thickness Colours available - Cream with Brown Border, Burgundy with Cream Border. Metal hotel table mats, metal placemats and coasters. A stunning new range of metal table mats which can be personalised in any full colour design, making them ideal for any restaurant or hotel table. Each table mat features a heat resistant backing in black synthetic leather to help protect your tables from hot plates & dishes (not suitable for sizzle dishes). Available in three metal colours - gold, brushed silver or white. Available in three sizes Large rectangular 290 x 230mm, Medium rectangular 250 x 200mm and Coaster 100mm square. Full Colour Design - Customise your placemats in any vibrant full colour design you choose. We're here to help so give us your ideas, images or text and we'll come up with a design for you! One off setup cost £35. Tarsus metal hotel table mats, metal printed placemats and coasters. 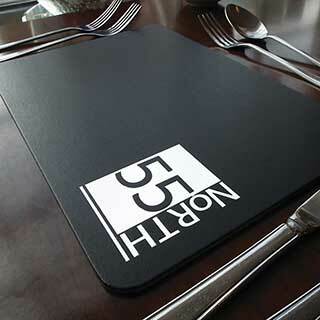 Stunning scratch resistant metal placemats and coasters with a powder coated metal finish. Can be personalised using your own design. Three sizes available. Can be personalised in two ways, white can be printed with either one or full colour, full colour has a slight frosted effect, while the silver mats can be printed with our unique Shadow Print that gives a dark grey/blue subtle effect. Available in silver or whte metal. Each table mat features a heat resistant backing in black synthetic leather to help protect your tables from hot plates & dishes (not suitable for sizzle dishes). Our Riva design hotel table mats and coasters are eco-friendly. 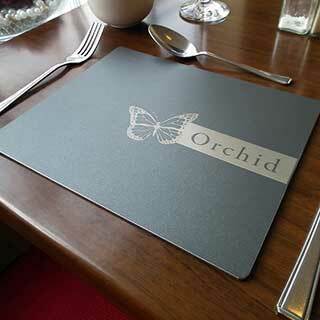 These soft-feel ecologically produced table mats are manufactured from recycled bonded leather. These table mats can be personalised with your own logo which can be blocked in a range of colours or our new clear blocking. One -off set cost for personalisation £35.00. Available in six contemporary colours - Black, Blue, Brown, Green, Pale Pink and Purple. Minimum quantity 10. Table mats available in four sizes - Rectangle 170x230mm: Rectangle 200x250mm: Rectangle 230x290mm: Square 230x230mm Coaster available in one size - Square 100x100mm. Four great shades are available - black, brown, red and white. Felt backing as standard. 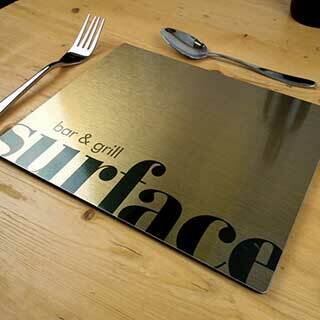 Tarsus metal engraved table mats have a tough scratch resistant powder coating, which can be engraved with your own logo, text or design. When engraved all finishes reveal silver metal underneath. Eight contemporary colours are available - Black, Blue, Brown, Burgundy, Graphite, Green, Silver and White. Three sizes are available - Large 290 x 230mm, Medium 250 x 200mm or Coaster 100mm square. For personalisation a one off set up cost £35 (Subject to sight of artwork). Minimum quantity 10. Apollo wooden table mats are manufactured from strong thick wood with a smooth felt backing as standard. 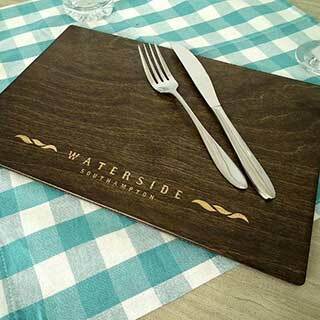 Our new wooden menus covers are available in four colours, dark wood, grey wood, natural wood and white wood. Apollo table mats can be engraved with your own logo, text or design to reveal the natural colour of the wood underneath (light wood offers a subtle effect). Engraving up to 90cm2 included in base price. One off set up from £35. Minimum quantity 10. 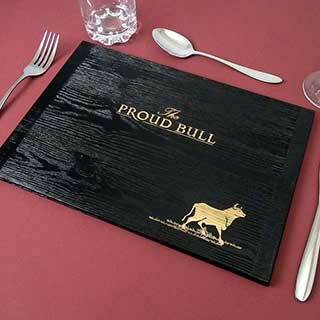 Custom melamine table mats manufactured from genuine melamine. 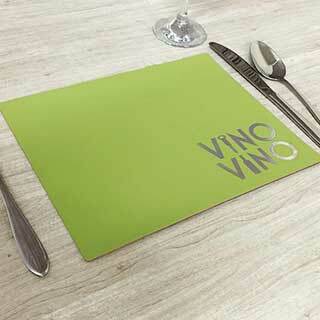 These stain and heat resistant table mats can be personalised with your own design, text or logo. Custom melamine table mats can be produced in almost any colour, shape and size so you are sure to be able to get the right effect. 4.8mm thickness. We have a minimum quantity of 30 for custom made table mats. Many sizes can be produced. Slip resistant cork or felt backing. Custom melamine table mats to your own design in full colour. One off set up cost £35. Table mats also available in bonded leather, leather, wood, metal and leather-look PVC.